Saunders AND Eubank Jr - Summer Rematch Imminent? Saunders AND Eubank Jr – Summer Rematch Imminent? The news that dropped earlier that both WBO 160lb mandatory Billy Joe Saunders (21-0, 11ko) and bitter rival, WBA interim champ Chris Eubank Jr (19-1, 14ko) are OFF Frank Warren’s May 9th Wembley show, hasn’t actually come as too much of a surprise to me. Before today’s news, in the fights they were meant to be in, neither man was really going to set that card alight anyway. Billy Joe, returning from injury still hadn’t a named opponent and Eubank was meant to be making a very routine defence of his own title against unheralded Australian veteran Les Sherrington. These were never meant to be in marquee fights on May 9th anyhow and the card will lay in the capable hands of Frank Buglioni, who will headline in his eagerly anticipated 168lb dust up with Romford’s Lee Markham. Rising starlet Mitchell Smith and London welter Bradley Skeete will now provide chief support. Every cloud and all that? And not just for Buglioni. The fact that neither will now box on the card, as well as Saunder’s own predicament changing because of an Andy Lee injury, means that it is the British fans – and crucially Eubank Jr – who are seemingly set to benefit this summer. The Brighton fighter has been desperate to get Saunders back in the ring to attempt to avenge the defeat he suffered in their first, much hyped contest last November. The slow start from Eubank cost him as the classier work from Saunders was evident from the off, and he began to run away with an early points lead. However, Eubank began to pressure and find his way back into the fight, yet 2 of the judges deemed it too late and in the end he dropped a close SD. From a fan perspective it was a great and entertaining scrap and the rematch was always going to happen, yet perhaps rightly for Billy Joe Saunders, the winner of the fight, he decided to pursue his world title ambitions by enforcing his status as WBO mandatory challenger to “Irish” Andy Lee rather than face Jr again immediately. After stepping aside to allow American Peter Quillin first crack at Lee earlier this month with a guaranteed shot at the winner, Saunders was well compensated financially and scheduled to box on the undercard until injury scuppered those plans. His outing on May 9th was meant to be his warm-up ahead of finally getting his crack at Lee – who was guaranteed to keep his own belt even before he fought Quillin when the American fighter failed to make weight. Talks for the summer showdown in either Ireland or the UK had begun between Frank Warren and Adam Booth who trains Lee. In the meantime since their first fight, Eubank had beaten a game but ultimately limited Russian in Dmitry Chudinov to capture the WBA interim strap in February. He won the title convincingly, battering and battering the champion who was stopped in the final round when he really should have been pulled out earlier for his own safety. 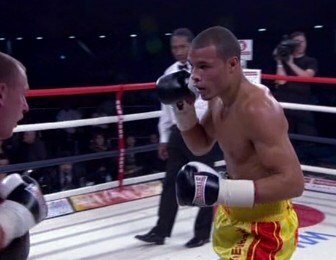 Hence Eubank Jr was to make his first defence on the card he has now withdrawn from. Serendipity is the word that comes to mind. At least for Eubank. He has been crying out for this rematch, and thanks to the injury to Lee, which nobody could have predicted, it looks like he is finally going to get it. In truth he always was, as it was a great fight first time round and financially in the UK it’s too good for all concerned to ignore. But Eubank wasn’t meant to get his chance at vengeance just yet and there is no doubting it will be a hard slog for Billy Joe if he walks into a fight like this without a tick over first. After all, that was what he was planning to do on the May 9 card ahead of fighting Andy Lee this summer. However, the Hatfield man has a ton of class and will be fully confident of winning the rematch regardless. The confident ex-Olympian thoroughly enjoys the bragging rights the first contest gave him and the genuine needle is reminiscent of Nigel Benn and Eubank’s own father 25 years ago. It is however possible that Saunders will seek to take a fight for the interim WBO belt, fight Andy Lee in the Autumn and then fight Jnr early next year? However that will only enforce the Eubank teams belief that Saunders is indeed delaying facing him as he is afraid he will get beat this time around. The fact they have also pulled out of the May 9th card tells me that something is close. If Saunders had NO intention of making the rematch now why would the Eubanks pull out too? Fighting for the WBO interim is equivocal to fighting for Eubanks WBA interim anyhow. Both titles are lightly regarded, yet should Saunders take the Eubank fight and get beat, it’s going to potentially ruin his mandatory status to Lee, although a voluntary defence could be arranged should that happen. Either way, in my eyes it’s looking like the British fans are going to see this fight in the Summer. It’s a great showdown that is set to be even bigger than the first. Domestically, there really is little bigger besides Brook-Khan and we all know that isn’t happening at the moment! Again, like the first fight it’s a pick-em. After last November it appears many on social media are confident of Eubank winning out this time but I’m not so sure. There is no doubt in my mind that the classier fighter is Saunders. Slick southpaw, proper boxer. The power is with Eubank Jr. I really think it’s going to be a stamina issue as last time out, both men were desperately tired come the end. Yet Saunders, despite his lack of commitment to his training at times, is the undefeated man and has boxed at the higher level in my eyes. The Chudinov win for Eubank is mis-leading in my eyes. In short, it’s exactly the same as the first fight going in really, except this time one man has a psychological edge. Both now know what the other brings physically and both now know they need to be in even better shape than the first time. It’s possible the strength, determination and will to win of Eubank will out this time around. It would set up a fabulous rubber-match and a rivalry to go down in British boxing history. Yet something at the back of my mind keeps telling me that Billy Joe Saunders has the quality to nick in on points once again. Either way it is a fantastic contest and a treat for British fans should it happen in the summer. I for one, can’t wait! You are here: Home / British Boxing / Saunders AND Eubank Jr – Summer Rematch Imminent?